On this day (October 20th) in 1890, Sir Richard Francis Burton died. Most of you pobably never heard of Burton and some of a certain age may mistake this Richard Burton for the Richard Burton the actor who today is best remembered for tagging Elizabeth Taylor. The Richard Burton I'm talking about was an extraordinary person who truly lived a life of adventure. I would highly recommend reading the entry on Burton in Wikipedia. 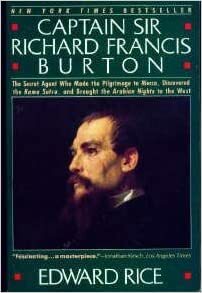 I can recommend Burton: A Biography of Sir Richard Francis Burton (1963)by Byron Farwell. As a matter of fact I can recommend all of Farwell's books.